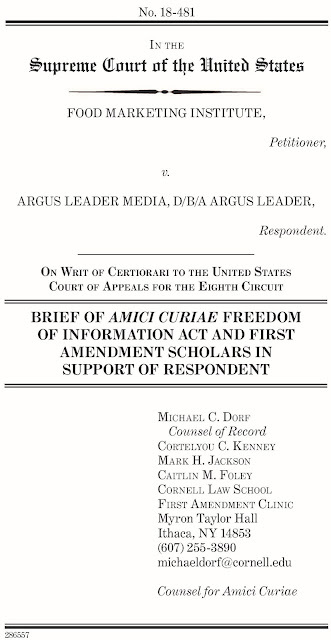 On April 22, the U.S. Supreme Court will hear oral argument in a Freedom Of Information Act (FOIA), 5 U.S.C. § 552 (LII), case concerning the federal open records law exemption for sensitive competitive information. Textually, the American access-to-information (ATI) statute, para. (b)(4) ("exemption 4"), exempts from disclosure "trade secrets and commercial or financial information obtained from a person [or legal personality] and privileged or confidential." State ATI laws have comparable provisions, and interpretation of the federal law is sometimes influential on state courts interpreting similar language. Plaintiff below, Respondent Argus Leader Media publishes the Argus Leader, the largest-circulation newspaper in South Dakota, based in Sioux Falls, and a member of the USA Today newspaper network. In investigation of federal food subsidies, the Leader invoked the FOIA to find out how much taxpayer money is paid by the U.S. Department of Agriculture (USDA) to individual food retailers. The USDA refused on a number of grounds, including exemption 4. Joining the USDA in resisting disclosure is a trade association of food retailers, Petitioner Food Marketing Institute (FMI). Applying the law to the facts, we find no basis for reversal. The trial evidence showed that the grocery industry is highly competitive, but is already rich with publically-available data that market participants (and prospective market entrants) use to model their competitors' sales. The evidence shows that releasing the contested data is likely to make these statistical models marginally more accurate. But the evidence does not support a finding that this marginal improvement in accuracy is likely to cause substantial competitive harm. The USDA's evidence showed only that more accurate information would allow grocery retailers to make better business decisions. On appeal (No. 18-481: SCOTUSblog, Oyez), the parties dispute how to interpret exemption 4. The Eighth Circuit followed the lead of the U.S. Supreme Court to define "confidential" as risking "substantial competitive harm." Even within that test, lower courts have divided over the requisite degree of certainty to bring the exemption into play, from the reasonable possibility of advantage to a competitor to a near certainty that economic loss will result. FMI would instead prefer that the Court embrace a much broader exemption: what FMI calls the "ordinary meaning" of the word "confidential," that is, simply, exempting from disclosure information that a company has not disclosed. Petitioner [FMI] argues for sweeping changes to FOIA’s test for disclosure of confidential commercial information under Exemption 4 used by all Courts of Appeals for the past forty-four years, beginning with National Parks in 1974. Acknowledging that FOIA does not define the term “confidential,” the National Parks court held that the statute requires disclosure— notwithstanding a claim that the withheld records are confidential commercial information—absent a showing of either (1) impairment of the government’s ability to obtain necessary information in the future; or, as relevant here, (2) infliction of substantial competitive harm to the information submitter. 498 F.2d 765, 770 (D.C. Cir. 1974). That test has withstood the test of time. Any change should come from Congress, rather than this Court, because of the unusual context of FOIA, and the unusual context of this case. Saliently, to my mind, the brief demonstrates congressional approval of the "substantial harm" test, and the FOIA ought not be reinterpreted contrary to its laudable aim of transparency. As I have written recently in another context, the greatest threat around the world today to transparency and accountability might come from the private sector as surely as from the public sector. There should be no question as to the need to maximize transparency where the two meet. While FMI lobbies Congress and works through a Food PAC and "political education fund," certainly taxpayers are entitled to know what public subsidies are being delivered to FMI constituents. Cornell Law School; Heidi Kitrosser, Professor of Law, University of Minnesota Law School; Seth F. Kreimer, Kenneth W. Gemmill Professor, University of Pennsylvania School of Law; Margaret B. Kwoka, Associate Professor with Tenure, University of Denver Sturm College of Law; James O’Reilly, Retired Professor, University of Cincinnati College of Law; and Nelson Tebbe, Professor of Law, Cornell Law School.